This work is part of a larger series entitled The Robbins Crown Series. The Robbins Crown Series references my family’s farming business based in Baker City, Oregon. By using the iconic symbol of the crown in conjunction with farming equipment, I hope to bring attention to the importance of farming and my role as successor in my family’s business. elevates my status within our family’s business. These crowns reference farming by including various tools and skills that I’ve acquired through the profession of farming. The Crown of Sickles is made of swather blades known as sickles, which are used to cut down alfalfa hay. The Twining Crown references an auger on a tractor. Augers twist hay inward so that the hay goes underneath and is collected by a baler. The auger compresses the hay and then wraps it with twine. The special knotting technique used by a baler is displayed as the center “gem” of the crown, signifying the knowledge needed to run farming equipment properly. The third crown, The Crown of Paths, depicts various different shapes and sizes of fields, with predetermined efficient harvesting paths. The crowns are constructed with structural integrity although they possess delicate materials. The intertwining of steel farming equipment with non-ferrous metals is forcing these materials to connect despite having different strengths. 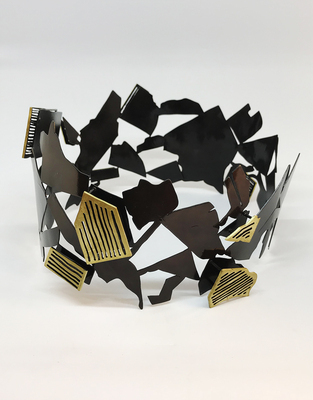 Being able to connect my family business with my artwork has brought out strength and power that is represented in these crowns. © Kassandra Leigh Robbins, 2018. Photo Credit: Anika Smulovitz.